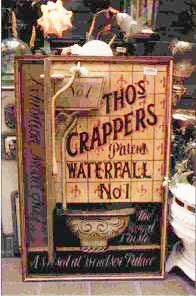 For this article we interviewed Dr. Andy Gibbons, historian of the International Thomas Crapper Society, and Ken Grabowski, a researcher and author who is writing a book on Crapper’s life. The date of Crapper’s death has also been a source of confusion for many years. For example, "Chase's Annual Events," the authoritative book for listing special days and dates, has listed January 17 as Thomas Crapper Day and January 17, 1910 as the date of his death. Fact. The origin of crap is still being debated. Possible sources include the Dutch Krappe; Low German krape, meaning a vile and inedible fish; Middle English crappe, and Thomas Crapper. Where crap is derived from Crapper, it is by a process know as, pardon the pun, a back formation.